Source: This is based on another recipe – but as with any other recipe on this blog, I edited a bit. The original recipe can be found right here. I found this one while looking for a simple muffin recipe, and one must admit that this must fulfill that demand – even to an extend that I didn’t expect. But since I don’t like raisins other ways than how they come in the package, that was a no-go, and since I had no lemon, so was that. 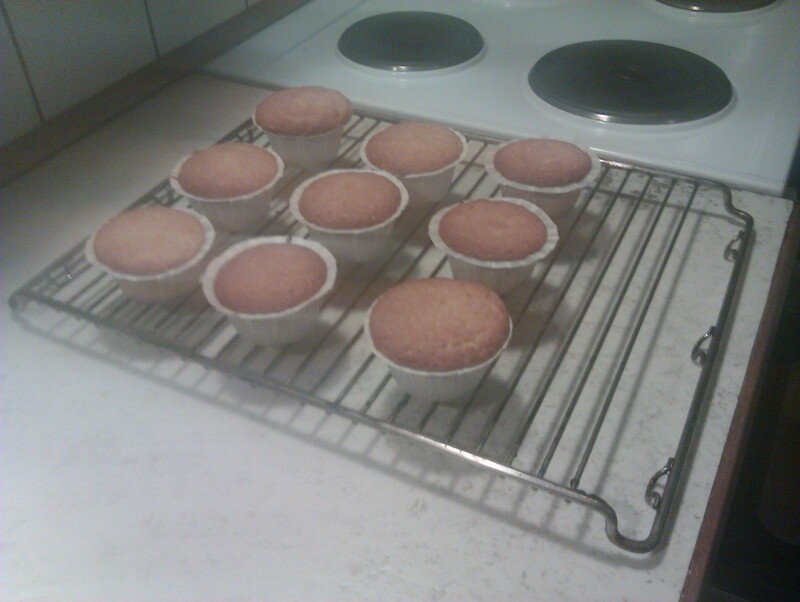 But although the muffins are great without, a dash of lemon might dress it well. Another perk is that these muffins freeze well. Let the butter soften – this makes it easier to work with. Preheat the oven to 200º C (390º F). Mix flour and baking powder – and mix it in with the rest. Divide between nine muffin tins/moulds. Bake for 15 minutes or until golden and unwobbly. 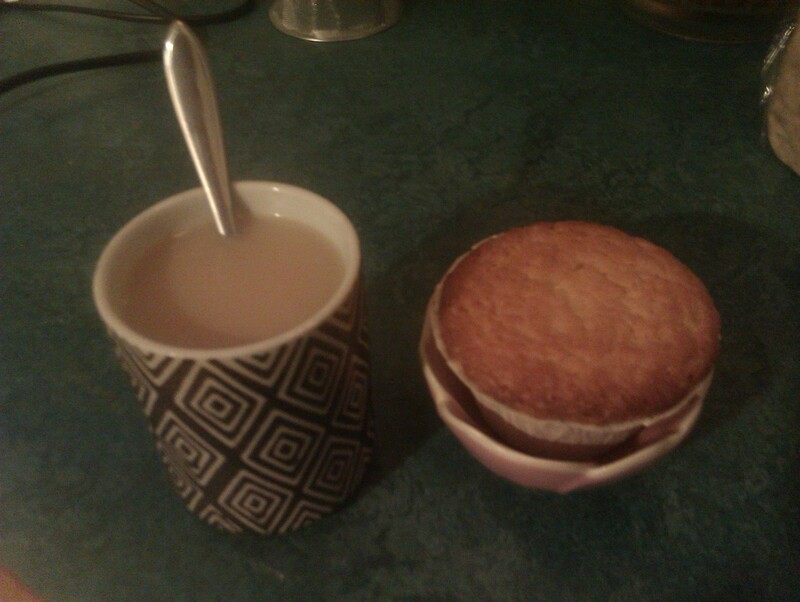 Enjoy with your afternoon/evening tea/coffee – eg. a good Earl Grey. This is something that I pull out for special occations – like holidays or special dinners where a roast is absolutely necessary. Like the family julefrokost. Although it’s a bit odd, cooked in cola and all, everybody love it and ask for it, and have been doing so since the first time I cooked it. It used to be my mother cooking the ham back in the days, but she cooked it in some way that made the entire house stink. When I then found a special (or should we continue with calling it odd?) recipe I wanted to try a few years back, I took my chance to suggest that I cooked the ham that year. And I’ve been cooking the ham for the annual family julefrokost ever since. Now, it’s no big secret that I got the recipe from Nigella Lawson. Then it’s said. But I *did* make some adjustments. I know Nigella has talked of making soup from the cooking liquid – now I can’t remember which one, but I will post it if I find it. Although I think I got all the good tips on timing worked into this recipe, I think it’s a good idea to read Nigella’s recipe, too, as I may not get all of the goodies on cooking and roasting into my version of the recipe. 1 small handful (or 1 unit) of cloves. Put your gammon into a pot, fat side down (if possible). Add the onion and cover ham and onion in Coca-Cola. Cook for 45 min. (add 15 min. if the gammon comes straight from the fridge). Put possible ice cubes into the large glass, pour the rest of the Coke over the ice/into the glass, squeeze lemon juice into it, and enjoy while cooking. Mix mustard and syrup in a small bowl. 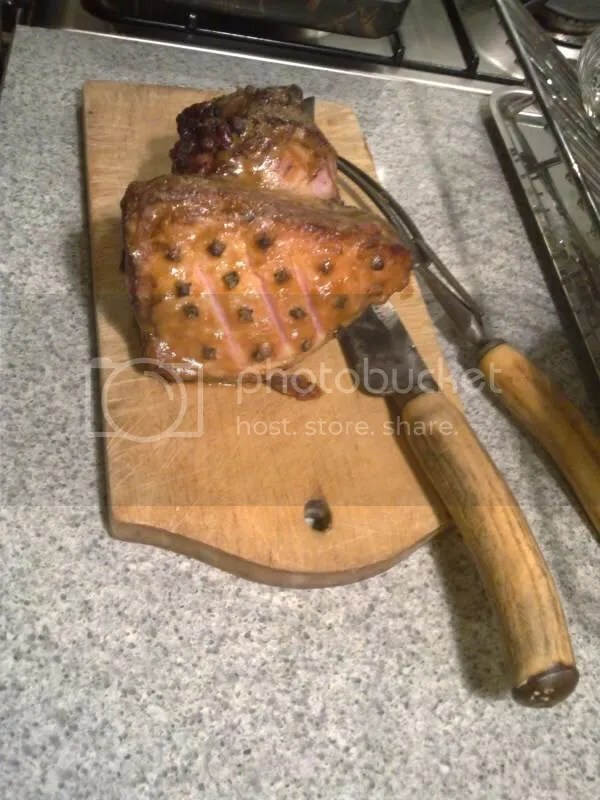 Preheat oven to 240º C.
When the gammon has been cooked (and is now officially a ham, I suppose), take it out of the liquid and put it on a chopping board. Slice off the fat, leaving a thin layer, score the thin layer with a sharp knife to make fairly large diamond shapes, and stud each diamond with a clove. 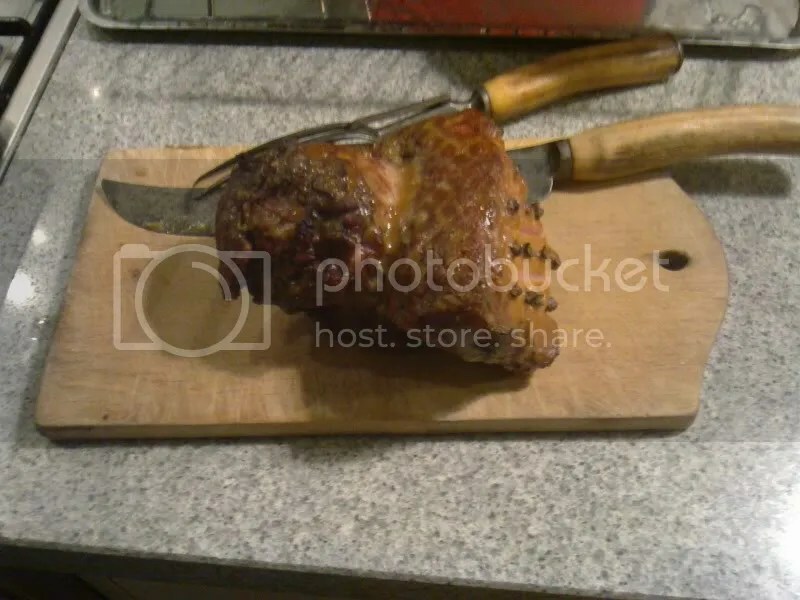 Place the ham in a roasting pan. Cover the “diamonds” with glaze, and pour the rest of the graze over the rest of the ham. Put it in the oven – the original recipe says it should be there for 10 minutes, but my nose could tell me different before the 10 minutes had gone, so keep an eye (and nose!) on it. Take it out (before it burns!) and let it rest. I’ve been at home for my family’s annual julefrokost (litterally: Christmas lunch; usually also describes a Christmas party at firms/companies/places of work or other organisations keeping adults busy, it’s a Christmas celebration, but not celebrating Christmas (Eve, Night, or Day(s)) itself. It’s one of the Danish oddities – like hygge). Luckily, we only needed one pot. When I wanted to make tea today, I luckily saw alternatives of keeping up the Christmas spirit while looking over the shelves of tea and spices. If you’re REALLY lazy, Chai is a really good alternative to Christmas tea (my best suggestions being Yogi Black Chai and Pukka Herbal Spiced Chai (since the last suggestion is herbal, even Latter-Day Saints can drink it!). If your local supermarket doesn’t carry it, ask for it at your local health food shop. Follow instructions on package. 1 unit = 1 cakespoon -or- 1 heaped teaspoon -or- 1 teabag. 1:1 means one unit of one tea, one unit of another and usually goes with one (1) liter of water. If you need more or less, just multiply it with liters of water. While there was about a cakespoon left of Christmas tea (the teapot in question takes two), I was happy to discover a box of Yogi Black Chai with one remaining teabag in it – and mixing them was a success! Possibly milk/cream & sugar/honey to taste. Put tea in pot/cup – if necessary, put loose tea in teabag or somesuch. Pour boiling water over tea. Leave it to steep for 7-8 minutes. Now, after having used the last Christmas tea, I was about to take the Christmas spirit down a notch – but then remembered one of the two most dominating ingredients of my favorite Christmas tea: Cloves (the second being orange peel). And then I took some cloves and let them steep with the tea. Leave it to steep for how long your favorite tea requires (Queen’s Blend requires 7 minutes).